Crafted by hand, a filigree-like elephant comes to life as a necklace by Pichaya. She works in silver to craft a lacy pachyderm pendant worn on a sterling chain. 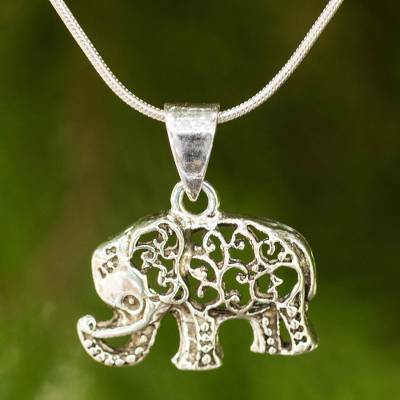 You can find sterling silver pendant necklace 'Filigree Elephant' by Pichaya in jewelry categories such as Animal Themed Necklaces, No Stone Necklaces, Silver Necklaces, Sterling Silver Necklaces and Pendant Necklaces. Enjoy exploring these sections for other Novica treasures. Love wearing this silver pendant necklace almost everyday! It's fashionable and unique! I bought this necklace for my stepson's girlfriend. She adores all things elephant and I was so happy to find this necklace for her. I'm even more pleased that Novica supports so many artisans and their work. This will not be my last purchase!